I have recently updated my website and this is my first blog post since making the switch. While I've blogged about juicing previously, it seemed like a fitting topic as many of us are seeking health strategies post holiday! Nothing hits the nutritional reset button like juicing. While some don't advise juicing in the winter, I actually love it. It feels like sunshine in a class, and who doesn't need that in Canada in January! Juicing seemed to take a back seat to smoothies the last few years and while there are benefits to both, such as increasing our intake of vitamins, minerals, antioxidants and phytochemicals, there are additional benefits unique to juicing. For more than a decade, I have juiced almost every day. While I do juice fasts (also now referred to as “reboots” or “juice feasts”) from time to time, generally, juicing is simply a part of my daily routine. I was probably drawn to juicing because of its long history with colonics, and the teachings of Dr. Norman Walker. Dr. Walker was an authority on colonics, and author of many books, including, Raw Vegetable Juices, which he wrote way back in 1936. He developed a juicer, The Norwalk, which is still available today and has become the Cadillac of juicers, and sells for a few thousand dollars. (Don't worry; you can spend as little as $100 on a decent starter juicer!) Dr. Walker studied living foods and developed a philosophy of the best way to nutritional health was with a diet of mostly raw food and juices which he termed “Living Food”. Dr. Walker lived to 118 years of age. Another proponent of juicing was Dr. Bernard Jensen, who is known as the father of Holistic Health. Among his numerous accomplishments, he authored many books, including, Dr. Jensen's Juicing Therapy: Nature's Way to Better Health and a Longer Life, and Tissue Cleansing Through Bowel Management. Dr. Jensen lived to a month before his 93rd birthday. Additionally, Dr. Jensen documented case histories demonstrating the extraordinary effects juices can have on rejuvenation and healing. 1. To juice you need a juicer. I have a Vitamix and I love it, however; I disagree with all of the high powered blender commercials that state they can make juice. It is more accurate to say that they can make a really thin and watery smoothie; however, it’s not true juice. 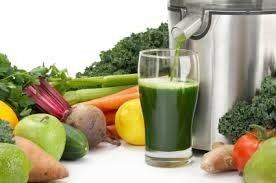 True fresh juice is the removal of the fibre from the vegetables and fruit. Blenders emulsify the fibre but it’s still there. While fibre from fruits and vegetables is healthy, besides increasing the amount of nutrients, there are two main objectives we are trying to achieve through juicing: Providing our digestive systems with a rest period, and, increasing the bio-availability of nutrients and their delivery to our cells. Both of these objectives are optimized when we remove the fibre, not just break it down. There is nothing wrong with thin smoothies, but we should know the differences and use them accordingly. To clarify; I am not a smoothie hater. I make smoothies too! 2. Drink your juice on its own, away from food. As mentioned, for the most benefits you want the digestive system to be as inactive as possible when you drink juice. Another important benefit from drinking juice on its own is live juices contain enzymes which when consumed away from food have strong anti-inflammatory effects. You don’t get this benefit if you drink your juice with or near a meal. If you aren’t fasting but still want to juice for the additional nutrients, you could juice as an appetizer (while making dinner is a great trick) and then eat dinner approximately 30 minutes later. Because many nutrients require fat for absorption, some experts advise adding a small amount of healthy fat to your juice. (This would also be accomplished if having food with fat 20-30 minutes after your juice.) I must admit I do not add fat to my juice, and don’t feel I have ever had an absorption issue. Listen to your body, experiment, and decide what’s best for you. What works for me is making my juice the first thing I consume each day. I prefer to exercise in the morning and on an empty stomach and then I juice shortly afterwards. This way I really get the anti-inflammatory benefits of the live enzymes. 3. There are 2 types to choose from when purchasing a juicer. The less expensive juicers are the centrifugal juicers. These use high speeds and a spinning motion. Vegetables and fruit are introduced through a shoot to a grinding blade, and then separated into different compartments of juice and pulp. Drawbacks to this type of juicer are that supposedly the high speeds and resulting friction will destroy some of the live enzymes, and the volume of juice from your juice is not always optimal especially for items such as leafy greens. Some centrifugal juicers do have more than one speed to minimize both of these issues. Because of the affordable price point, centrifugal juicers are a good budget conscious option, and if you aren’t sure juicing is something you’ll keep doing it’s a less risky initial investment. The second type of juicer is called a masticating juicer. These juicers basically crush then squish out the juice from the produce. There is no spinning action and they work at low speeds. They are typically more efficient in terms of volume of juice extracted. This type is more quiet which may or not be important to you. These juicers take more time to actually produce juice, and often in the clean-up process. This is a major factor to take into account in deciding on your purchase. So which is the best juicer? The one you will use! Start with the one that makes sense to you and your circumstances. You will reap benefits from either. 4. Juices begin to loose nutrients as soon as they are made, and virtually all the live enzymes will be gone within 24 hours. Although some manufacturers of masticating juicers say their juice is fresh for 72 hours I personally would stick with the 24 hour guideline. It is always best to drink your juice as soon as it’s been juiced for the most nutrition, and frankly that’s when it tastes best! Second best is to store in an air tight, opaque container to reduce its exposure to air and light and drink within 24 hours. Your body can only absorb about 1 cup of juice at a time so drink slowly, and less more often when possible. You can also “chew” your juice for a few seconds before swallowing which sends a signal to your digestive system to secrete enzymes. 5. Be careful and wise if buying “fresh” juice. You want to check the expiry date (There is a company in London producing their juice in Toronto and selling it here with an expiry date of over a month, yet advertising it as fresh. You also want to ensure your juice is primarily vegetable juice with just a bit of apple or pear for sweetness. If it contains beets or carrots (or both) you want even less fruit, for reasons below. Another place in town is adding lemonade and maple syrup to their juice. My guess is they are mimicking the Master Cleanse? Stick with vegetable juice. In my opinion, investing in a centrifugal juicer within your budget and juicing yourself is far better than buying cold pressed juice that has sat on a shelve for more than 24 hours, let alone a couple of weeks. Focus on vegetables. Add in only one type of fruit for sweetness to avoid digestive distress. Most juicing books will recommend this food combining principle and it's also a good way to keep your juice primarily vegetables. For example, juice as many different vegetables as you want, but only add in apple, or pear, but not both. The exception to this rule is you can add lime or lemon with another fruit. Your combination should be primarily vegetables to minimize the risk of blood sugar issues due to the sugar (fructose) in fruit. Some juice books will outline plans incorporate fruit juices as part of a fast. If you choose to experiment with fruit juices dilute the juice with purified water, and drink it slowly. Better yet; if you are doing a juice fast work with a Holistic Nutritionist. Put some thought into what produce you use. Different vegetables and fruits have different properties and benefits. Some are strong detoxifiers. Once again, seek guidance to plan your approach with a juice fast, and what vegetables, and fruit, will be best for you and your health goals. Be mindful of any food intolerances. If you get an upset tummy when eating beets, don’t juice them! Pay attention to how you feel after consuming your juice such as energy level, headaches, dizziness, moodiness, or other symptoms. Use organic and non-genetically modified produce. (And local, of course, when it’s possible!) If you can’t find organic, peel your produce (that you can) as the concentration of pesticides is most often in the skin and just under. Unfortunately, that’s also where a lot of nutrients are, which is another reason to buy organic as much as possible! Don’t be afraid of the carrot. The poor carrot got such a bad rap due to the Atkin’s diet. Yes; they are sweeter than other vegetables but they aren’t going to send your blood sugars swinging like pineapple or watermelon juice. Additionally, carrot juice is beneficial for the liver, and promotes healthy bacteria in the gut. If you are oxalate sensitive, avoid produce high in oxalates just as you do when eating. This can be quite limiting for juicing; therefore my suggestion would be to first deal with the underlying cause of your oxalate sensitivity with the help of a Holistic Nutritionist. For those who are not in my area, I do offer counseling sessions by Skype. With so much to consider it if may feel overwhelming, but the health benefits of juicing are so worth the effort! It’s really not that difficult and like anything new we try, it’s about just getting started. We are what we eat and what food could be more nourishing and high vibrational than live juice?